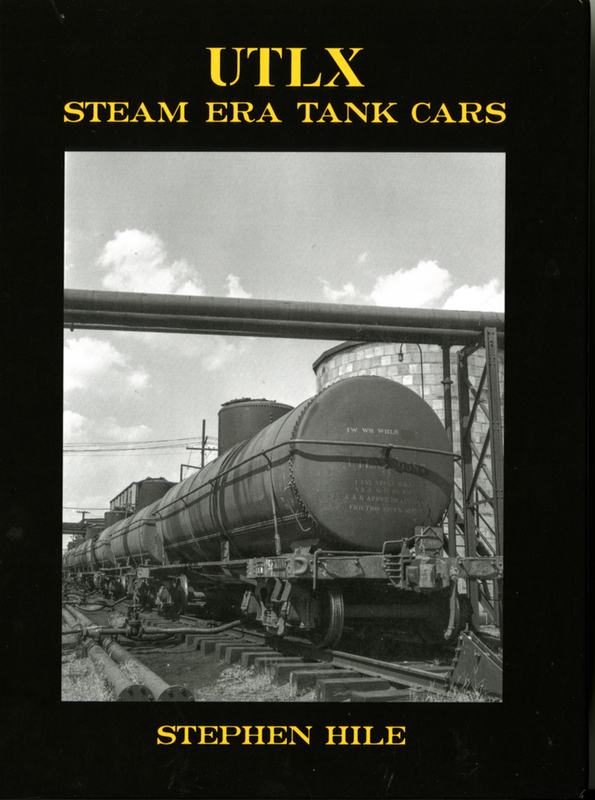 I have just received my copy of Steve Hile’s new book on UTLX tank cars. It is a superb collection of information and photos, and anyone interested at all in steam era and transition era freight cars will find it both interesting and most informative. The publisher is Speedwitch Media and the cover price is $85. The cover is shown below. You can purchase the book online at the Speedwitch site, www.speedwitchmedia.com . This is an 8.6 x 11-inch hardbound book, with 278 photos and 36 drawings (complete cars and car details) in its 246 pages. It covers the span of time from the beginning of the 20th century, to 1952. Why is this book important? For one thing, in 1950 the UTLX fleet was the largest group of tank cars in North America, with about 38,700 cars. General American, then the predominant leasing company, was right behind at 37,500 cars, with Shippers Car Line (the leasing arm of American Car & Foundry) a distant third at 7,500 cars. (The largest railroad fleet at that time, Santa Fe, was a mere 3,570 cars.) Within the UTLX fleet, one design type, the Class X-3, comprised about 18,000 cars, nearly half the fleet, though these cars were of several different sizes. A car fleet like this simply begs to be described and understood. Union Tank Line, as most readers know, was an important component of the Standard Oil trust before its breakup in 1911. Thereafter, Union continued as an independent company, but like many of the “baby Standards” after the breakup, retained very cordial relations with its former Standard brethren. 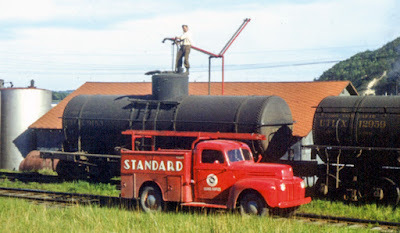 For decades after 1911, many refineries of Standard Oil descendants continued to be served almost exclusively by UTL tank cars. Steve Hile explains in the book that he did get some research assistance from Union Tank Car Company, still in business today, though most of their older records are long gone. They did provide a substantial number of excellent photos, nearly all of which are previously unpublished. 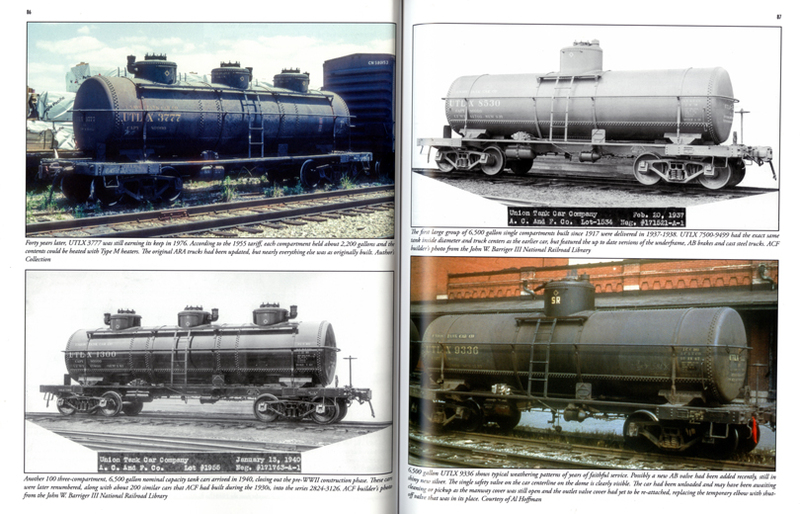 The roster information in the book, a great assist to the prototype modeler, had to be pieced together from a variety of sources, because the original UTL data no longer exist. But the rosters are a great addition to our knowledge, even if a few gaps remain in the information. The book has only a limited amount of color photography, though for subject matter which was painted black, this is not a serious limitation. Photographs in the book are printed at a size which is very helpful for studying details. I show below a sample spread across two pages (pages 86 and 87), and you can see the point I am making. In his acknowledgements, author Steve Hile credits the late Richard Hendrickson with getting him started on an interest in UTLX cars, as well as supplying information and photos for the book. The result of Steve’s work is a book that Richard would have been delighted to see. It is exactly what he believed the hobby needed: complete and accurate information on the prototype. This is a great book for freight car people, and I cannot recommend it highly enough. Publisher Ted Culotta of Speedwitch, along with author Hile, deserves great credit for bringing this book to us all. Warm thanks to you both. No fair! My copy hasn't come yet. (But it sure looks good in your post). Good day, Any mention of the utlx cars that were running on the narrow gauge railway in Canada?